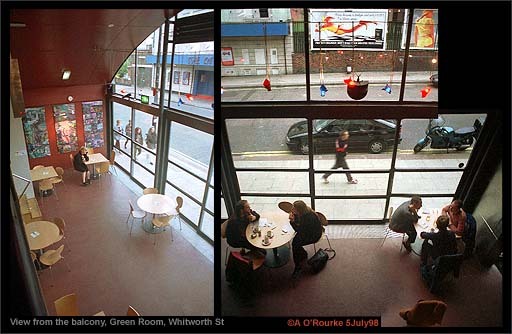 On Sunday July the 5th I visited the Green Room theatre, and met Tamsin Drury, Arts Co-ordinator for DS98. We chatted about how things had gone and which events she thought were particularly successful. "All in all the festival had gone extremely well" she told me, though she expressed some disappointment at the low turn out for some of the events. "We've tried to break down barriers and encourage the audience to take risks...", i.e. to come to events they wouldn't normally come to. "All the Green Room events have been free". I asked her which events she was most pleased with. "Aerial Ambience was particularly accessible - people were playing with it for ages." She also praised Michael Pinsky's work: 'Transparent Room'. 'Self-Elimination' by Robert Pacitti was another piece she liked a lot, describing it as: "disturbingly beautiful". Not all the works featured at the Green Room can be called digital art, though they are heavily influenced by digital media, she said. Tamsin Drury is a freelance arts producer and, since 1996 has run hAb (pronounced "hoeb" - should have a circle on the A - it's Danish for "hope"), an arts production and development organisation. Her partner in hAb is Helen Cole.